Provided aid for suppression of Spanish Influenza and similar epidemics. The law also provided for the establishment of quarantine regulations. World War I officially ends with the treaty of Versailles, on June 28, 1919. The 18th Amendment to the U.S. Constitution-which begins the era of alcohol prohibition-is ratified in January 1919, to take effect in 1920. Congress establishes the Grand Canyon as a U.S. National Park (1919). Congress approves the 19th Amendment to the U.S. Constitution guaranteeing women the right to vote and sends it to the states for ratification (1919). Congress passes the Jones Act (also known as the Merchant Marine Act of 1920) that regulates maritime commerce in U.S. waters and between U.S. ports. According to the U.S. Census Bureau, Alaska's population in 1920 is just over 55,000. 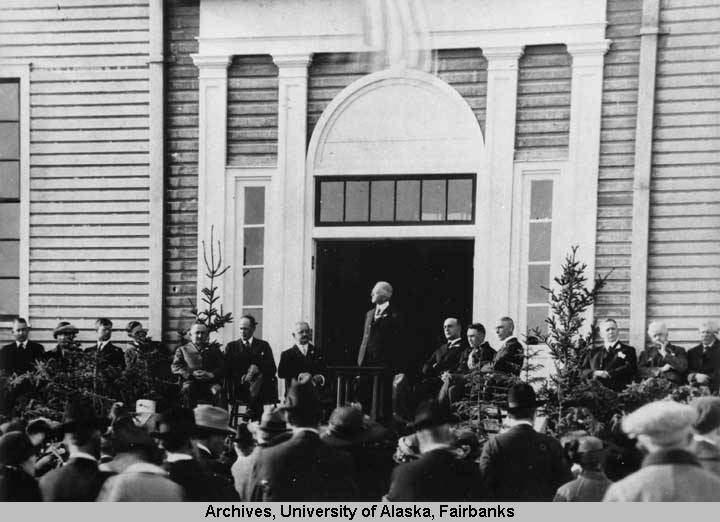 Anchorage incorporates and Leopold David is elected as the first mayor of the city (1920). The League of Nations forms in Paris (1920).